Metrolink has a special selection of summer destinations to help you enjoy this season. 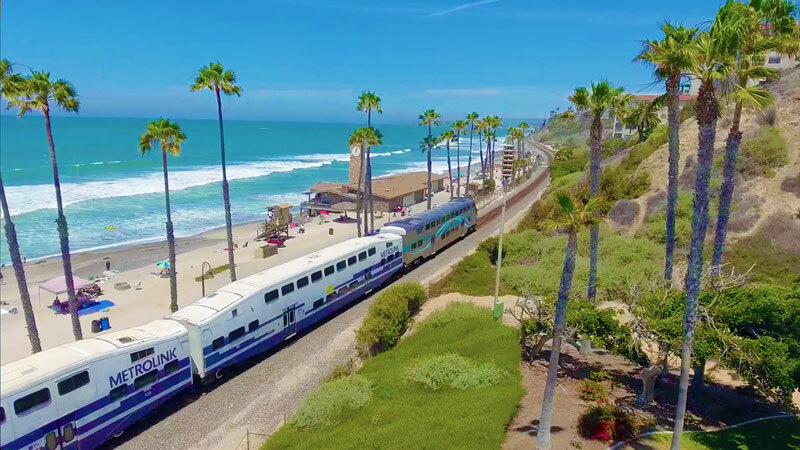 We decided to help you see all those amazing places around the Los Angeles area and try a train ride! Go Glendale is giving you a Metrolink Round-Trip Ticket that can be used for any destination of your choice. The promotion will last until all the tickets are distributed, so sign up now to guarantee your ticket! 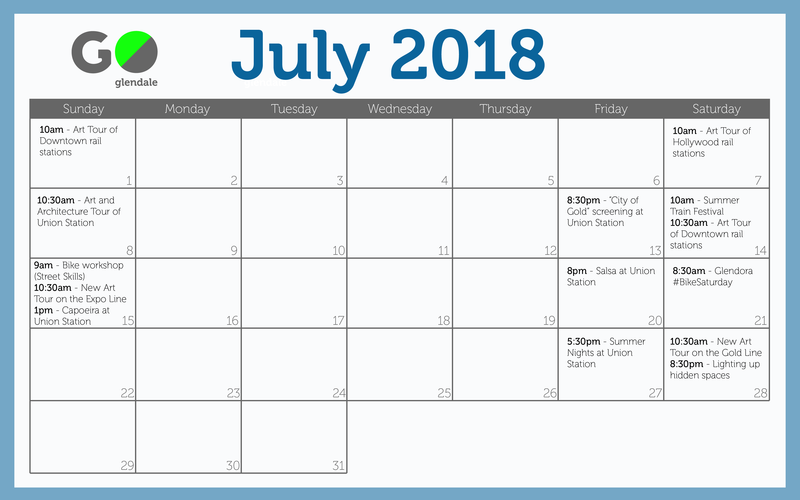 Metro is hosting a great number of events in July 2018. Do you want to be part of it? We created a calendar that can help you navigate through the dates of the events and enjoy your summer. Sunday, July 1: Art Tour of downtown rail stations. Meet at the Union Station information kiosk near the Alameda Street entrance. Time: from 10 a.m. to noon. Saturday, July 7: Art tour of Hollywood rail stations. Meet at the street level entrance to the North Hollywood Station (Red Line). Time: from 10 a.m. to noon. Sunday, July 8: Art & Architecture Tour of Union Station. Meet at the Union Station information kiosk near the Alameda Street entrance. Time: from 10:30 a.m. to 12:30 p.m. More info here. Friday, July 13: “City of Gold” Screening at Union Station. Metro Art Presents “City of Gold” (2015, 96 min, Dir. Laura Gabbert) as the second installment of our summer food film series, “Fil…mmm at Union Station.” Doors open at 7:30 p.m. in the historic Union Station’s North Patio. Time: from 8:30 p.m. to 10 p.m. More info here. Saturday, July 14: Summer Train Festival. Check in at the Union Station Information Booth for a festival map and free Event Passport. Time: from 10 a.m. to 5 p.m. More info here. Saturday, July 14: Art tour of Downtown rail stations (en español). Meet at the Union Station information kiosk near the Alameda Street entrance. Time: from 10:30 a.m. to 12:30 p.m.
Sunday, July 15: Bike Workshop (Street Skills). If you are comfortable getting on a bike and want to gain more experience bicycling on city streets in a group setting. This ride will apply practical skills and critical thinking in real-world settings and will build off skills learned in the Bike 1 and Bike 2 level classes. Location: Northwest Pasadena. Once you have registered, you will receive specific location details. Time: from 9 a.m. to 11:30 a.m. More info here. Sunday, July 15: New art tour on the Expo Line. Meet at the entrance to Downtown Santa Monica Station. Time: from 10:30 a.m. to 12:30 p.m.
Sunday, July 15: Capoeira at Union Station.Join Metro Art Los Angeles in welcoming Capoeira Exchange for an afternoon of movement and music as we explore the beautiful, entrancing practice of capoeira. Location: Union Station Ticketing Hall. Time: from 1 p.m. to 4 p.m. More info here. Sunday, July 15: Join us for an afternoon of movement and music as we explore the beautiful, entrancing practice of capoeira in Union Station’s ticketing hall from 1 p.m. to 4 p.m.
Friday, July 20: Salsa at Union Station. Turn up the heat as one of Southern California’s most exciting and progressive salsa bands, LA Picante, takes over Union Station Ticketing Hall for a vivacious night of salsa. Doors open at 7:30 p.m. Time: from 8 p.m. to 10 p.m. More info here. Friday, July 21: Glendora #BikeSaturday. Join fellow riders for Glendora #BikeSaturdays in the bicycle friendly business district! The ride goes on the new Glendora Urban Trail from Louie Pompei Park to Sunflower Ave. Time: from 8:30 a.m. to 10:20 a.m. More info here. Friday, July 27: Summer Nights at Union Station. Metro Art Presents the first installment of the “Summer Nights at Union Station” series in collaboration with KCRW. Join us for dancing, games, food and music provided by KCRW DJs Jason Bentley + Travis Holcombe. Location: Union Station’s South Patio. Time: from 5:30 p.m. to 10 p.m.
Saturday, July 28: New art tour on the Gold Line. Meet at the entrance to Del Mar Station. Time: from 10:30 a.m. to 12:30 p.m.
Saturday, July 28: Lighting up hidden spaces. Lighting up hidden spaces is a participatory bicycle light show that invites all community members to come and dress your bikes for a bike show. Join People for Mobility Justice (fka MCM) for this night ride presented by Metro’s Bicycle Education Safety Training (BEST) Program. Time: from 8:30 p.m. to 10:30 p.m. More info here.